Where Can I Find White & Milk Chocolate Drops? I have been looking for these tiny round white and milk chocolate "drops" for forever. The local candy store closed down over 2 years ago and they used to sell these tiny round balls of chocolate that were white chocolate covered in milk chocolate... or vice versa. I craved them the whole time I was pregnant, but not only can I not find them anywhere, I can't even figure out where he sourced them from! If anyone knows where I can find these, or what they might be called please let me know. I live in Ohio so these may have just been a local thing, but I don't know. I'm from Ohio, too, but I don't think I'm familiar with the white and milk chocolate drops you are referring to. You said that they are "tiny." How tiny is tiny? :) I'm a big fan of malted milk balls (pictured above). Are they about that size? Half that size? Smaller? The size of M&M's? Smaller? I'm also wondering if they literally are milk chocolate dipped in white chocolate and white chocolate dipped in milk chocolate, or perhaps something a bit different. Is the coating a creamy coating like basic chocolate that has set or is it more of a crunchy shell coating (like an M&M)? 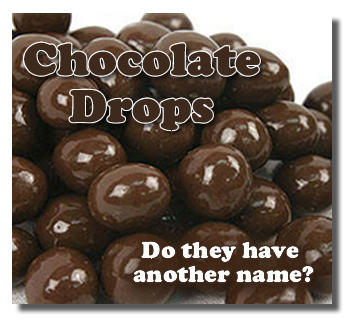 The other type of chocolate drops that I'm familiar with are more of a chocolate coated cream filling. They generally aren't round, but... I just wanted to put that out there and try to clarify exactly what it was that you are looking for so hopefully someone else (whether they are from Ohio or not) might come up with the correct name for the treats you're craving. Do you happen to remember the name of the local candy store where you used to purchase these round chocolate chocolate covered chocolates? What town was it in? I'll keep my eyes open, too! They were about the size of m&ms but the chocolate didnt have that crunch of the candy coating. They were melt in your mouth goodness. Also don't remember if I said but I believe they were dusted with cocoa. Not sure, but from the look of them, could they be this store's version of chocolate covered malted milk balls?